MOSCOW. July 10 (Interfax) – Russian MPs may remove the provision criminalizing compliance with Western anti-Russian sanctions in the country from a draft bill that is currently under consideration in the lower house of the Russian parliament, State Duma Chairman Vyacheslav Volodin said. “Everyone, including the business community, experts and deputies, have reached consensus on the second part of the bill [concerning criminal liability for incitement to introducing anti-Russian sanctions],” Volodin told reporters on Tuesday. As for the first part of the bill, which, if enacted, will amend the Russian Criminal Code with regard to criminalizing anti-Russian sanctions’ implementation on Russian territory, “we have adjusted our opinion further to that dialogue that we had with business people and the expert community and we believe that this article should either be left within the limits of administrative liability or be removed in general,” Volodin said. When requested by Interfax to clarify whether this provision may be completely removed from the draft bill, Volodin said yes. “Our goal is to create conditions for attracting investments and to do the best to have their figures grow,” he said. Presently, debate is underway on whether it is reasonable to keep administrative liability for businesses complying with anti-Russian sanctions on Russian territory, Volodin went on. As for those who call for introducing sanctions and commit such actions (referred to in the second part of the bill) intentionally, “the business community primarily raises the question of the need to punish such acts,” he said. 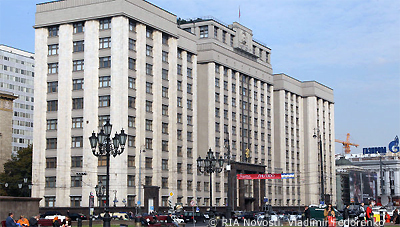 Volodin did not rule out that the State Duma may consider this bill before the end of the spring session ending in late July. Russia’s State Duma earlier passed in the first reading the draft bill criminalizing implementation of anti-Russian sanctions on Russian territory. The legislative initiative had prompted a strong reaction from the business community. The draft bill in its first-reading version would add a new chapter into the Russian Criminal Code on “restricting or refusing to carry out ordinary economic operations or transactions in order to facilitate the implementation of restrictive measures introduced by a foreign state, a union of foreign states or an international entity”. In the event that a Russian legal entity or a constituent part of the Russian Federation or a Russian municipal entity or, equally, any person under their control (any Russian private or public subject) denies any Russian citizen, who wishes to make an ordinary economic operation or transaction, acting in implementation of any anti-Russian sanctions, such actions will be punished with a fine of up to 600,000 rubles or a restriction or deprivation of freedom for a period of up to four years. The bill also stipulates possible punishment in the form of forced labor for a period of up to four years. The second innovation of the bill criminalizes “such actions committed by a Russian citizen as to facilitate an introduction by a foreign state, a union of foreign states or an international organization, of any restrictive measures against Russian private or public subjects or any persons controlled by those, particularly by means of providing recommendations or sharing information, which has resulted or could result in any restrictive measures introduced against Russian private or public subjects or any person under their control”. In this case offenders will face fines of up to 500,000 rubles or forced labor or restriction of freedom, or up to three years in jail. The sponsors of the draft bill, including Volodin and Federation Council speaker Valentina Matviyenko, claimed that this legislative initiative is aimed at “protecting the interests and the security of the Russian Federation, the rights and freedoms of Russian citizens, and the rights and legitimate interests of Russian legal persons”.